Beyond The Audition Screen by John Tafoya features twenty seven orchestral works currently requested at timpani auditions. The included CD-ROM contains the entire timpani parts in Adobe Acrobat PDF format for further study along with annotated forScore files for the Apple iPad. Each page includes important items to consider in preparing each orchestral work. 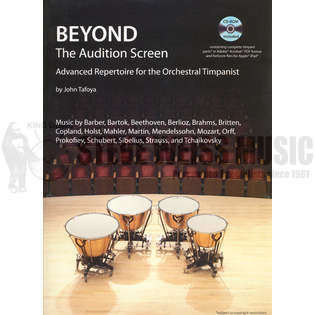 These observations are taken directly from John Tafoya's own personal experience with orchestral timpani auditions and his professional experiences in rehearsals and performances with world-renowned conductors. The reader will also enjoy a variety of musical and technical options presented in this book. Options include: edited dynamics, stickings, timpani mallet recommendations, illustrations, exercises, errata, extra notes, tempos, and an interesting section on timpani maintenance by the owner and manager of the American Drum Manufacturing Company, Marshall E. Light.